Holy moly. Only 9 weeks left?! Oh, and by the way, in case you hadn't heard (Facebook peeps got this broadcast loud and clear on Monday) ... the doctor was right: Ewan changed position in the frame of time she expected he would, and this put me quite nearly back at what is considered "normal" size (1 cm of uterus growth per 1 week of gestation). 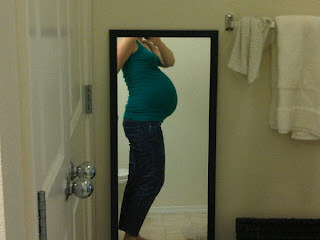 Now instead of the "huge" lopsided belly, I have an appropriately sized and well-centered one. Yay!! At my last appointment on Monday (31 weeks), I was measuring 33 cm (just 2 cm "big") and the appointment before that (29 weeks), I was measuring 37 cm. So that's a substantial improvement -- an effective "shrinkage" of 6 cm, given the lapse of two weeks between measurements. From what I've heard, it sounds like 2 cm of variation is the point at which they measure things just to make sure things are progressing normally. So I will have another ultrasound at 33 weeks just to see how big a baby boy my feisty little Ewan is. It's amazing that just by him changing position, the size of my belly actually diminished in size. No wonder I feel so light and even more energetic -- so much less like I'm constantly listing to the right. Now. If only I could go back to that lady and dare her to call me "huge" now. Yay! Loving your doctor . . . what a champ! Great news!! Praying for even more great news at your ultrasound! Getting super excited to "meet" Ewan! Before I read this, I wondered if you had posted an old belly photo because your belly looks noticeably smaller. But none of that matters as long as Ewan is comfy! Yep - you can totally tell that he has settled in. Now he will just start to head south! haha! Lookin good, mama! NINE WEEKS?? Wow... it's the home stretch now. It's amazing how the baby can move around. I kept going back and forth between your photos. God is amazing! Not only at how He can create someone but also how He orchestrates their movement and growth.